The constant X-factor, why is it constant? Paper title:Why is the Milky Way X-factor constant? Did you think the X-factor was what all X-men had in common? Actually, the X-factor is one of our most valuable tools for studying star formation. It is the number we use when we need to infer the mass in molecular gas given the mass of CO in a region. 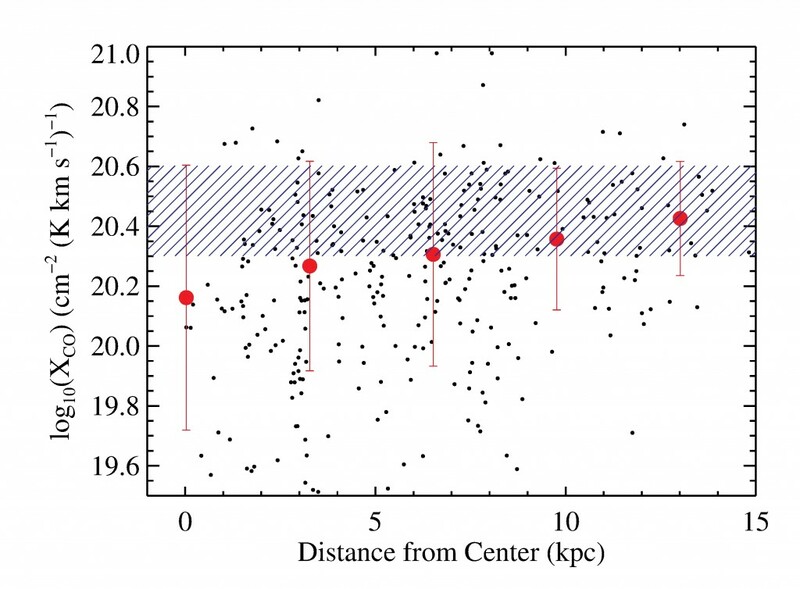 In this paper, the authors try to elucidate why the X-factor has been observed to be roughly constant across our Galaxy and other disc galaxies. 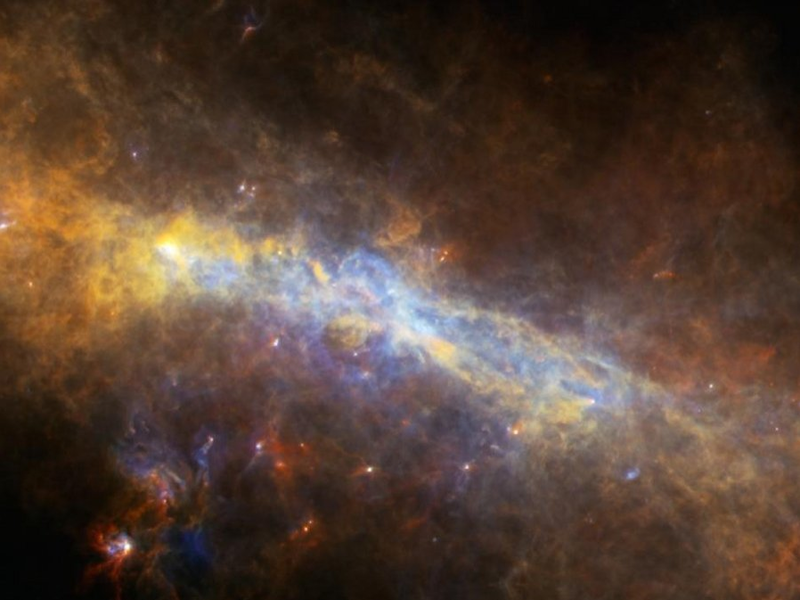 Star formation occurs in regions where molecular gas is dense. If we want to understand how stars form, we need to study these regions, called “giant molecular clouds” (GMCs). However, the most abundant molecular species, H2, is very elusive (which is explained in more detail in this astrobite). If we cannot measure H2, what is the second best probe of star-forming regions we can use? We look for the next most abundant molecule, which is CO. This species is easier to detect because its first couple of rotational excitations are triggered at the typical equilibrium temperature of a GMC (roughly 10 K). You can think of these excitations as discrete changes in the angular momenta of the molecules. and it is typically taken to be a constant at XCO ~ 2 x 1020 cm-2 (K km s-1)-1. In the paper we will be discussing, the authors focus on the X-factor from the first rotational CO transition. It has long been a puzzle why the X-factor is roughly constant in our Galaxy and nearby disc galaxies, although there is evidence that star-bursting galaxies and low metallicity galaxies have lower and higher X-factor than that of the Milky Way, respectively. Suppose we wanted to use simulations to study what determines the value of X-factor. These simulations should be able to resolve GMCs and, at the same time, track the effect of the environment on the clouds. This implies that we need to resolve a large dynamical range: following the evolution of the gas in galactic scale to a scale on which the GMCs are well resolved (parsec-scale) and to include all physical mechanisms acting on that range of scales. In the paper, Narayanan & Hopkins (2012) use simulations to study the properties of GMCs and construct simulated X-factors. Of course, first they needed to make sure that their simulations reproduce the observed properties of GMCs. In particular, astronomers have long been concerned with the observed low star formation efficiency in GMCs. For a long time, simulations tended to make more efficient star-forming GMCs than observed. The answer to this problem seems to be including the effects of the radiation deposited by massive stars into the interstellar medium (“radiative feedback”). Recently, this paper (Hopkins et al., 2011) implemented stellar feedback in galaxy formation simulations, being able for the first time, to resolve GMCs in their environment in a consistent way. Narayanan & Hopkins (2012) use those simulations in their work. and velocity dispersions up to 20 km/s. This results in X-factors of roughly 2-4 x 1020cm-2 (K km s-1)-1, which is in agreement with the value observed for the Milky Way, as we show in the figure below. The authors compare the derived X-factors to what you obtain from a simulation without stellar feedback. In the second case, the X-factors are 2 to 3 times larger and the simulated properties of GMCs do not agree with the observed ones. In the case with stellar feedback, radiation pressure tends to disperse the clouds, leading to lower surface densities. This is the main effect, but since it also prevents gravitational collapse, it lowers the velocity dispersion of the clouds (interestingly, this was discussed in this astrobite) and their temperature (by decreasing the average densities). All in all, simulations of Milky Way-like galaxies that incorporate stellar radiative feedback and resolve GMCs on pc scales are able to reproduce their physical properties. Moreover, the authors suggest that the narrow distribution of X-factors in Milky Way-like galaxies is just a consequence of the resulting ranges of values for those properties. This work provides assurance to researchers studying star-formation in GMCs and trying to estimate their H2 column density that taking the X-factor to be constant is a reasonable assumption for galaxies like our Milky Way.